Forget gimmicky tools designed for just one exercise. 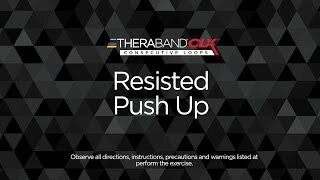 The key to the truly perfect push-up can be found in a versatile elastic resistance band, such as the Thera-Band CLX. In fact, in a recent study presented at the American College of Sports Medicine conference, Spanish researchers used electrodes to measure muscle activity. The results showed band-assisted push-ups activate pectoral muscles just as much as a bench press—and that’s loading up the bar with 70 percent of the maximum amount you can lift once. The resisted push-up also has perks beyond what you’d get in the weight room. For one thing, you’ll build more strength in the backs of your shoulders. And because you use your abdominal muscles to stabilize you, you’ll fire up your core muscles up to six times more than you would on the bench, the study found. What’s more, you can do this push-up anywhere, anytime. Here’s how. Begin by placing your hands into the desired Easy Grip Loop. Typically the end loops of the CLX are the best option, but for added resistance you can move your hands closer to the center of the CLX. Place the CLX flat across your upper back in line with your scapulae. Then put your hands on the ground to assume the plank position, arms straight. Slowly lower your torso until your elbows are bent almost to a 90-degree angle. Hold briefly, then return to starting position. To increase the complexity of this exercise, add another CLX of lighter resistance. Hold this second CLX in your hands in front of your body. Follow steps 1 through 3. As you return to the plank position after the push-up, roll into a side plank, resisting the CLX when raising your hand to the sky. Hold briefly, then return to plank position.